make us forget the past. Their destruction is such that a new order emerges despite determined efforts to preserve established norms. This new order, which was previously unimaginable, ushers in fresh values and behaviors that define the accepted way of doing things. When terrorists destroyed the World Trade Center on September 11th 2001, Americans’ understanding of tragedy was forever changed. The personal freedoms and lax civic attitudes of the past were replaced by vigilance and personal limitations. Seven years later, Lehman Brothers filed for bankruptcy and brought the global economy to the brink of collapse. Overnight, the promise of cheap credit disappeared and Americans learned how to enjoy their lives with less money. These events don’t only change the world, they alter people’s worldviews. The human experience of destructive change begins with a sense of loss and denial, which turns to anger and the subsequent phases in Elizabeth Kübler-Ross’s model of The Five Stages of Grief. Destructive crises create an arresting sense of vulnerability that threatens all trust relationships. 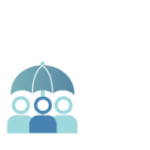 From a business perspective, maintaining loyal customers during and after a crisis begins with reducing vulnerability and actively affirming trust through each stage of crisis and recovery. In this way, understanding customers’ mindsets enables true business resiliency because the organization is able to fortify trust during times of great uncertainty. A review of two recent crises, the Financial Crisis and Hurricane Sandy, illuminates essential actions that diminish or fortify trust. From the standpoint of maintaining trust with customers, the global financial crisis was nothing short of a failure. The lack of empathy on the part of business, demonstrated through poor communications and inaction, created a perception of apathy. If there’s one thing that business should have learned from the financial crisis, it’s that people don’t like to feel afraid. When businesses fail to demonstrate concern for the things that customers value, a perception of apathy emerges. Many investors became cynical after the financial crisis, and the financial services industry is feeling their scorn. According to Gallup, the number of Americans invested in “an individual stock, a stock market fund, or in a self-directed 401(k) or IRA” was just 52%, down from 65% in 2007. Hours before Sandy made landfall, large national banks including PNC Bank, American Express, and Wells Fargo notified customers living in the storm’s path of flexible policies for late payments. After the storm hit, many additional large banks followed suit and within the week, most of these same institutions extended the period in which waivers were in effect. After the storm, AT&T and Verizon deployed trailers to devastated areas, helping residents recharge phones and computers or simply access the Internet. AirBnB waived its fees and encouraged homeowners to reduce rates by 50 percent. Two strong and strikingly different leaders, New York City Mayor Mike Bloomberg, a cool-headed command-and-control manager and New Jersey Governor Chris Christie, an emotional man-of-the-people, guided their regions through a very unfortunate chapter in history. While Mayor Bloomberg instilled confidence through his command of the situation, it was Governor Christie who won the hearts of voters across the country when he toured his devastated state. He instinctively knew that when people feel vulnerable, the single most human thing a leader can do is to show them that you care. In the years since September 11th, 2001, the threat of terrorism in the United States has been joined by new categories of threats that are beyond the control of any one government or business. 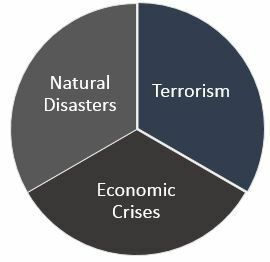 Together, terrorism, natural disasters, and systemic economic crises compose a disturbing phenomenon with significant costs to business. The U.S. government spent in excess of $100 billion in 2012 responding to floods, hurricanes, wildfires, droughts, and heat waves, according to the Natural Resources Defense Council The cost of the 2008-2009 Financial Crisis at approximately $22 trillion, according to estimates from the Government Accountability Office. The Boston Marathon Bombings cost a total of $333 million, according to U.S. News. dependent on culpability. In contrast to traditional crises that stem from errors within a company, social crises typically originate from events that are beyond the control of a single business. While most financial services firms were not responsible for the market’s extreme volatility in 2008 and 2009, they still had a responsibility to help investors through the emotional storm. Investors were traumatized and these firms said and did very little to ease their pain.Although crisis planning is still a discipline of mitigating legal, financial, and reputational liabilities, it is also about leadership. Specifically, it’s about leadership as a demonstration of responsibility without liability. When communities are devastated, everyone has a role. and businesses have distinct roles. Responding to citizens’ needs during a devastating crisis is an effort increasingly shared by business and government. The lines of responsibility are not formally marked but with each event, distinctions emerge. of uncertainty must guide communications. Arguably, global economic uncertainty began during the financial crisis, but it has not gone away. Instead, new forms of uncertainty have been added to citizens’ economic woes. The unpredictability of terrorism and natural disasters causes people to feel less safe, which undermines their well-being.Because people feel excessively vulnerable in a crisis, businesses must actively strengthen trust relationships with customers during this time and demonstrate empathy. There is no substitute for preparation. Business disruptions from social crises can last for weeks, if not months. To maintain operational consistency, businesses will need to institute flexible work arrangements and enable greater levels of autonomy for employees. Informal communication channels and authorization processes must be nurtured prior to a crisis event. Read more or purchase the Crisis Framework tool by clicking here.